Since 1951, Iron Mountain has been the 'Trusted Guardians' of customer assets. This includes more than 30 years of excellence in wholesale data centers and colocation. To become the global leader in storage and information management takes a strong focus on logistics and the details. Together, our combined expertise, data center services and secure, reliable colocation facilities provide an end-to-end solution ensuring the little things don’t get lost in the transition. 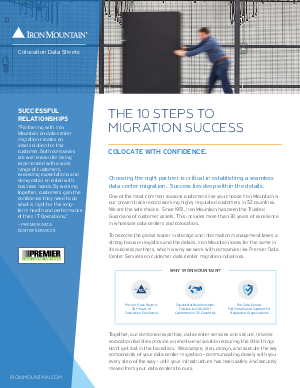 We analyze, plan, design, and execute the key components of your data center migration - communicating closely with you every step of the way - until your infrastructure has been safely and securely moved from your data centers to ours.